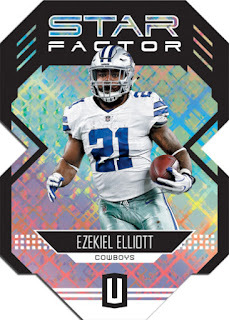 When it comes to Wow!-worthy special effects on football cards, they get no more enchanting, no more diverse, no more borderline hypnotic than Panini America’s visually arresting Unparalleled Football franchise. 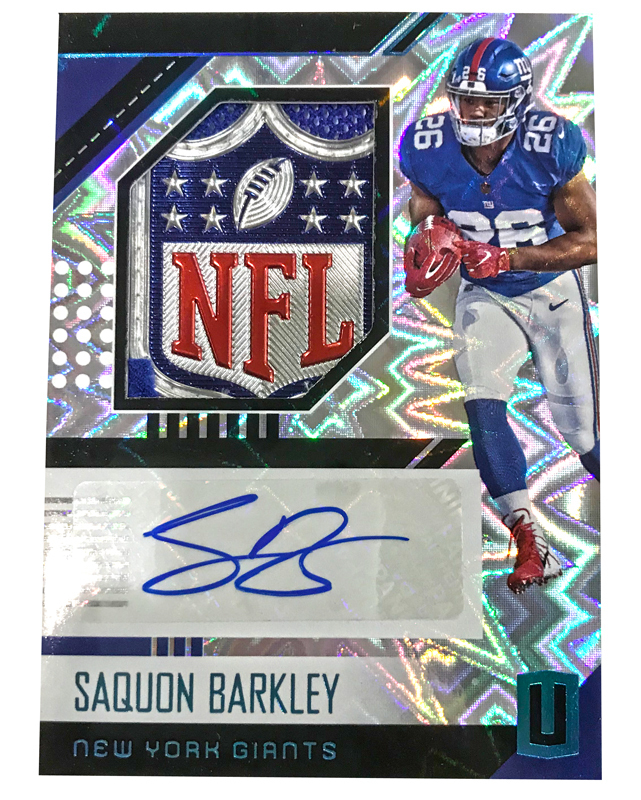 It’s been that way since the product first launched for the 2016 season — and it’ll be that way again when 2018 Unparalleled Football arrives Wednesday at Sports Cards Plus, with a 300-card base set (200 veterans, 100 rookies) base set featuring a whopping 10 parallels. Once again this season, the 200-card base set will include the first Rookie Cards for more than 60 veteran players. 2018 Unparalleled Football also features the football debut of the popular Galactic parallel that falls once per case on average. Also new for 2018? 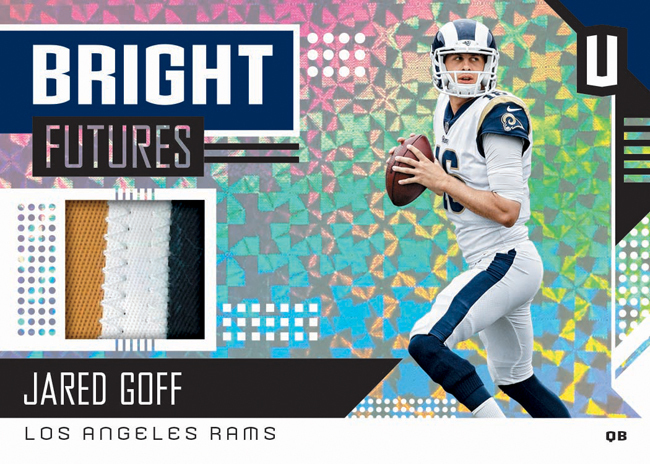 A slew of inserts such as Victorious and Bright Futures, both of which include prime memorabilia versions. 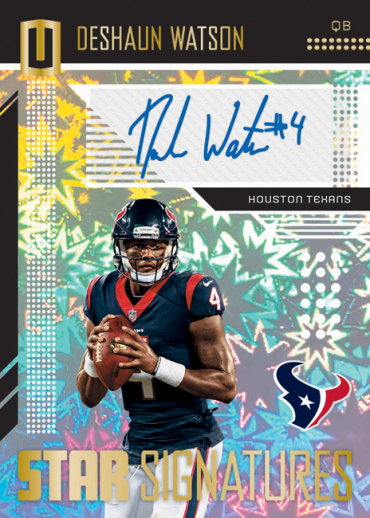 On average, each hobby box of 2018 Unparalleled Football (eight cards per pack, eight packs per box) will deliver two autographs, one memorabilia card and seven numbered parallels. The foundation of the Unparalleled base set is a striking parallel structure featuring Flight (one in three packs), Shine (one in five packs), Astral (numbered to 200), Superplaid (numbered to 150), Whirl (numbered to 100), Impact (numbered to 75), Hyper (numbered to 25), Fireworks (numbered to five), Galactic (one in 192 packs) and Burst 1/1 versions. Rookies boasts a roster of 100 players from the 2018 NFL Rookie Class. On average, each pack will deliver two rookies. 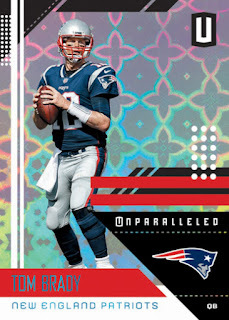 Each card is printed on vivid holographic paper and features the same parallels and numbering with the exception of Galactic (which falls roughly one in 384 packs for the rookies). In addition, some rookies will have autograph versions in the Signatures (one in 20 packs), Signatures Hyper (numbered to 25 or less), Signature Fireworks (numbered to five or less) and Signatures Burst 1/1 chases. swatch of authentic memorabilia and an autograph and paralleled by Impact (numbered to 75 or less), Hyper (numbered to 25 or less), Fireworks (numbered to five or less) and Burst 1/1 versions. Find signatures in five unique autograph sets: Rookie Jersey Autographs, Rookie Signatures, Pioneer Penmanship, Star Signatures and Undeniable. Each autograph set features parallel versions numbered to as low as one. Pioneer Penmanship celebrates some of the greatest legends to play the game. Look for autographs from players who played from the 1950s, ‘60s, ‘70s, ‘80s and ‘90s. Cards are numbered to 199 or less and feature four distinct parallels. Star Signatures features a star-studded list of signers on cards numbered to 99 or less; look for four different parallels. For the first time in Unparalleled find the exceptional Star Factor Die-Cuts — featuring 10 of the biggest names in the NFL in a short-printed die-cut design; find Whirl, Hyper and Burst parallels.